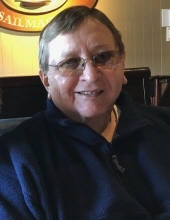 HILLSDALE-Jack Miller, 74, of Hillsdale left the comfort of his recliner and garages for greener pastures on March 21, 2019. He was born April 21, 1944 in Hillsdale, Indiana to Glen Miller and Lois Dell McCarty Miller. His regrets were few, but included parting with anything he could possibly use someday and working, even though he took an early retirement from Eli Lilly and Company after nearly 30 years of employment. Jack is survived by his mother Lois Dell and the love of his life, Rita Tickle Miller, his wife of over 45 years whom he married December 30, 1973. They had three children, Denise (Tim) Akers of of Mecca, Brian (Emily Payne) George of Clinton and Kristi (Paul) Johnson of Montezuma. He liked his kids but preferred his grandchildren Andy Akers, Macy Johnson, Logan Johnson, Baylee Johnson, Hannah Hall, Alec Hall and Amaya Hall. He had two siblings; Joan Brooks and Don Miller. He was preceded in death by his father, Glen Miller, older and smarter sister Pat Servies, and granddaughter Sydney George. Jack was a member of the Montezuma Fish and Game Club, American Legion, and the Vermillion County Park Board. He also served in the United States Army National Guard and attended Hillsdale High school and graduated from Montezuma High School in 1962. His hobbies included making messes, starting projects left mostly unfinished, and being at the beck and call of his grandkids. He was loved by many and will be missed by most. A celebration of life will be held in his honor in the near future. To send flowers or a remembrance gift to the family of Jack Miller, please visit our Tribute Store. It will be casual and we hope people come with memories to share. In lieu of flowers, we ask that guests contribute to a memorial fund for the Vermillion County Park Board if they so desire. "Email Address" would like to share the life celebration of Jack Miller. Click on the "link" to go to share a favorite memory or leave a condolence message for the family.